Road Trail Run: In Depth Adidas Adizero Sub2 Multi Tester Review: Highly Engineered yet Simple, Sleek, Light and Elegant State of the Art "Flat"
In Depth Adidas Adizero Sub2 Multi Tester Review: Highly Engineered yet Simple, Sleek, Light and Elegant State of the Art "Flat"
Article by Sam Winebaum, Derek Li, Peter Stuart, and Mark Dorion. and a single continuous slab of Continental Microweb outsole with no plastic or carbon plates. The contenders couldn't be more different in their approach! Sam: At first glance our black Sub2 looks like a low slung, classy lifestyle shoe. with its low stack height, the white "3 Stripes"- and only on the lateral side, and a mottled gray and white midsole. There are no flashy indications this is a high performance racer. The fit is sublime with no pressure points and is highly supportive, iwhile light and easy feeling on the foot. I was true to size with plenty of well held mid foot and heel room. The toe is a touch short in medium light socks but I would not size up. I was right between sizes, at true to half size up in the Adios Boost 3. Here I am true to size. When compared to the adios Boost 3 at the same size what is most noticeable, while it appears the last is the same, is the higher front toe box volume and increased comfort created by the elimination of the fairly thick suede overlays of the Adios. The rest of the fit towards the rear is similar although overall slightly more relaxed, lower slung and lighter on the foot in the Sub2. Peter: My first impression was “wow, what a sleek, light, elegant race shoe”. I love the all black upper with a splash of white (and yes, orange showing through if your foot isn’t in it”. Sam, I agree that it looks like it might be a lifestyle shoe rather than a racer. It’s such a seemingly bare-bones construction. I couldn’t wait to take them out for a run, even though I’d just done a marathon 2 days earlier! Mark: Judging from comments I received while doing errands around town and at my wife Helen's big birthday on April 7, this is one "hip," lifestyle-looking shoe. Perhaps even the priciest, fastest lifestyle shoe in history?! Sam notes that there is plenty of heel room. I would have liked a slightly snugger fitting (not narrower, just with a bit more "wraparound" feel) heel. My feet are also relatively narrow in the heels, fairly wide in the forefoot. The glued-in sockliner: For me there were pros and cons to this. I wanted a slight bit more arch support, so I put small arch support under insole (it was not hard to peel back the glued-in insole). I have worn GoMebRacers in some long races and again-- with a little modification to the arch or insole-- was fine at up to 50 miles on rubberized track. If I were racing a marathon or longer in these today (about to turn 59, with 46 years of training and racing on my body), I would go up half a size and add a second removable insole. I have done this many times in my career, even in marathons in 2:27> 2:35 range, and in 100Km races. The shoes still "feels" fast to me, not mushy as some might suspect. The single layer mesh is actually woven slightly denser on the inside than outside to create vertical bands of support towards the midfoot and rear and bands across the foot upfront. This differential weaving is totally invisible from the outside but can be seen holding the shoe to the light off the foot. Three very thin underlays are located on the inside under the painted "3 Stripes" on the lateral side with furthest forward one broader. On the medial side we have a single vertical underlay to the rear and then a broader thin panel further forward for some medial support as illuminated in the picture below. On the medial side a single external overlay with "adizero" printed on it is backed up inside with 3 internal underlay strips as on the lateral side. The result of these underlays is a secure yet non constraining light touch mid foot support which is very subtle in feel yet effective. The underlay wraps the toe box creating some more than adequate front of the foot height. At the very front toe bumper the underlay may be ever so slightly stiffened. The result is a very easy fitting, light and breathable upper with no apparent hot spots so far and a consistent secure fit and feel that doesn't squeeze the feet to pain as many race flats do. This by no means a wide upper but those with moderately wider feet seeking a race fit may find it quite accommodating. Although far less scratchy than the adios Boost 3, I would hesitate to run it barefoot for a long race. The sockliner with drain venting holes is glued in. The ankle and achilles collar is adequately padded as is the tongue. Gone is the long, puffy, and slightly scratchy tongue of the adios Boost 3. Both achilles and ankle collar are considerably lower than the adios Boost 3 and on the foot a bit more relaxed in hold. The Sub 2 has a conventional and relatively firm heel counter. The upper, as the saying goes, fits like a glove but not an overly snug one. Peter: Sam gave you all the technical stuff, so I can just say that I’m a big fan of the upper. It’s sleek, the mesh is super breathable and it fits really, really well. I do get a bit of rubbing on the outside of both pinky toes, but it’s not terrible. The big feat here is that this shoe is actually pretty highly engineered, but feels simple. It’s a terrific upper. And once again, I prefer mesh to knit. Derek: I really like the upper too. It is light, ventilated and unstructured in a way that does not feel sloppy. Overall I think they did a great job nailing the shoe volume of the shoe. I actually went a half size down by accident as Adidas Singapore listed the shoe with UK sizing, and for Adidas UK8.5=US9, whereas it is US9.5 for most other brands, and I did not realize it was the wrong size until after my second run in the shoe, because I did not have any issues with the sizing apart from my pinkie toe getting a little too snug up front with thicker socks. Generally I would recommend going true to size with this shoe though. With this shoe I only needed minimal lace tension to get a good snug fit, and I had zero issues with heel slippage; overall the fit is much better than the similarly weighted Takumi Sen Boost. Mark: The subtle, curved overlay circling around the upper perimeter of the toe box caused blistering on the great toes on both feet. 11.5 was true to size for me, adequate length, but toes just got rubbed-- even while wearing lightweight socks. I have a narrow heel and wider forefoot. Derek notes "minimal lace tension." For me the narrow, rounded, slightly slippery black laces were hard to adjust just as I wanted them. Replacing them with a pair of traditional flat green 45" laces worked well for me. 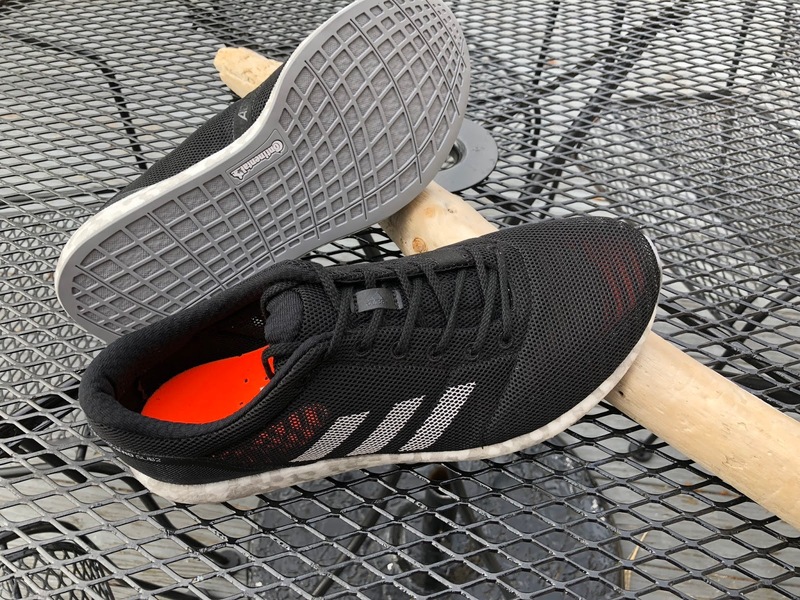 Sam: The Boost Light midsole, unlike its predecessor in the adios Boost with its EVA layer and Torsion plastic pieces to stabilize "uncaged" Boost is a totally different and much lighter foam. It is firmer without being harsh, much lighter than relatively heavy (compared to EVA) traditional Boost, and most importantly clearly feels like it has less lateral deflection under load which in prior adi Boost racers required all those controlling, stabilizing elements. All by itself with just the outsole in the mix it is very stable. Under load the feeling is firm, well controlled, and surprisingly shock and vibration reduced for such an incredible, low slung, light shoe. Very little of the jarring response of conventional race flats here, just a smooth fluid and firm response, of course aided by the outsole, the geometry and the simplicity of the construction. Unlike many race flats, and particularly Nike for me, as they are so narrow at the heel, the geometry at the rear landing is broad with a chamfered heel, with slightly more midsole width bulge on the medial front of heel than lateral for a touch of stability. Despite the very light weight, there is "enough" cushion for this heel striker, if firm. The heel landing is felt more I think due to the 21mm stack ( I struggle as a heel striker with anything less than 25mm) than the Boost Light foam but is not harsh or shock laden, doesn't bottom out, and has a measured fast response. The mid foot feel is a bit thin and overly flexible, lacking the decisive snap of many race flats, so mid foot landers may fatigue a bit there while the forefoot underfoot feels surprisingly broad and well cushioned for me. I have had no foot fatigue in my shorter 5-7 mile runs in them. It does have 2mm more forefoot stack than the adios Boost upfront and I notice and welcome this. This midsole would be a total winner and more versatile if it had a 3-4 more millimeters stack height at the heel and a couple more millimeter or so to the front to make it an 8mm drop shoe This change would add cushion at the heel, stiffen the flex at mid foot, and provide a touch more forefoot cushion. Nike Zoom X in the VaporFly has a silky softer feel than Boost Light, tempered and controlled by the carbon plate. The Reebok Floatride series has a somewhat less silky soft feel than VaporFly as its midsole has firm stiff EVA sidewalls. 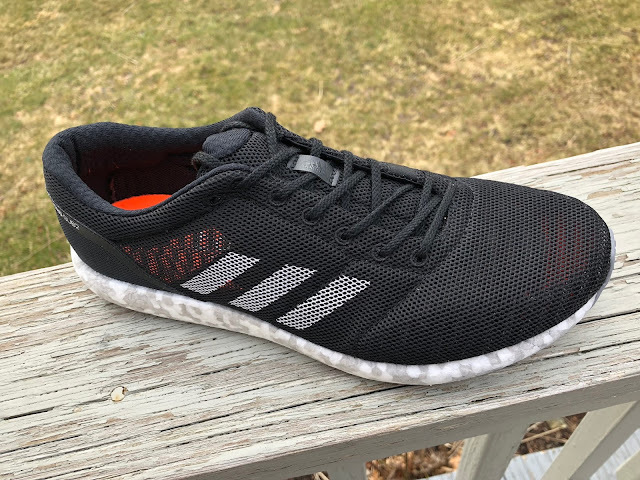 With Boost Light I sense a firmer, more consistent steadier, compression and rebound than Boost for sure, and it seems a denser ,more stable under foot material than in the Vapor Fly as well as Adios Boost even with no stabilizing pieces in the Sub2 mix. I believe the midsole foam is made of PEBA as the VaporFly and the Reebok Flightride series but here looking closely, Sub2's appears to be made of expanded pellets just as the original Boost was instead of the melted and injected material found in the Reebok and Vapor Fly. Injecting the foam would produce a smooth consistent surface on the side walls as seen on these last two. Peter: The midsole is where Sam and I begin to diverge here. I don’t particularly love Boost--I don’t feel any real bounce or energy return from it and it’s heavy. At least Boost Light is, well, lighter. I’m a midfoot/forefoot striker and this shoe is a punisher for me. The midfoot feels thin and I feel pretty beat up after a few miles. I find them plenty stable, but I get neither a decent amount of energy return nor a bouncy feeling from the Sub-2. The midsole feels a bit too firm--stable enough--but firm. Derek: I have generally found Boost to be a firm compound, and apart from the Energy Boost, find the Boston and Adios Boosts to be quite harsh underfoot. With this new PEBA-based Boost compound, even though it feels firmer than regular Boost, there is pretty good vibration dampening. The compound doesn’t really feel bouncy when you run, but I cannot think of another shoe with such low stack numbers that afford such a degree of vibration dampening for me. Having said that, I think the shoe could have used a little more stack across the board, even at the cost of a weight penalty, to appeal to a wider range of running abilities. Stability-wise, the low stack and firm midsole are a recipe for a very stable feeling shoe across the board. I don’t think Adidas ever had issues with stability in their shoes, apart from maybe the UltraBoost, and they were never going to have such issues with a low stack shoe. Mark: As others have noted, at my age and with so much wear-and-tear on my body, I would have liked a tad more stack along the full length of the shoe. I agree that the shoe as is may be fine for a legitimate "SUB2" aspirant, but maybe adidas should be targeting sub-2:30 or even sub-3:30 more. I am guessing that back when Sam and I were racing cross country' track' road races in our New England collegiate days, we would have been fine with the SUB2's as is (they may even have felt "plush" by the standards of the late '70's). I have not found the Boston or Adios to be "harsh underfoot." Yes there were some leather overlays in the upper that were harsh, but the SOLES worked fine for me in many races. Sam: The outsole is a single slab of Continental rubber, the Microweb. It is thin and full coverage. It is hard to know how many miles it will last but generally even thin Continental outsoles are very durable. The single piece outsole in combination with the single piece midsole and no Torsion gives the shoe a flex very similar to the adios but a touch longer and more natural feeling. While potentially slightly less stable at mid foot than the adios overall, I find the Sub2 pretty darn stable for such a light shoe and minimal upper. I think the snap and pop of the shoe could be improved by filling in some of the mid foot outsole to create more of a platform. Peter: The outsole seems fine. It’s plenty grippy and is smooth enough through the transition due to the full coverage. Derek: The outsole is very grippy. Perhaps the most grippy road flat I own, easily on par with the likes of the Nike Streak LT 3 or 4. 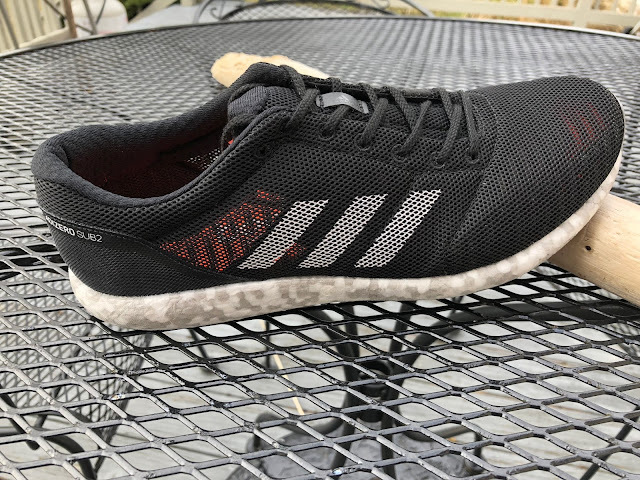 I don’t have enough miles to comment much on durability but if the durability of the blown rubber on the Adios Boost 3 is anything to go by, the shoes should last quite a while. I like that the shoe has very good flexibility, as it allows for a more natural pronation and transition when running in this shoe. Mark: Continental comes through again! I am HARD on shoes-- run with a shuffling gait, hard heel strike, and unusual biomechanics (again-- at this stage of my career). 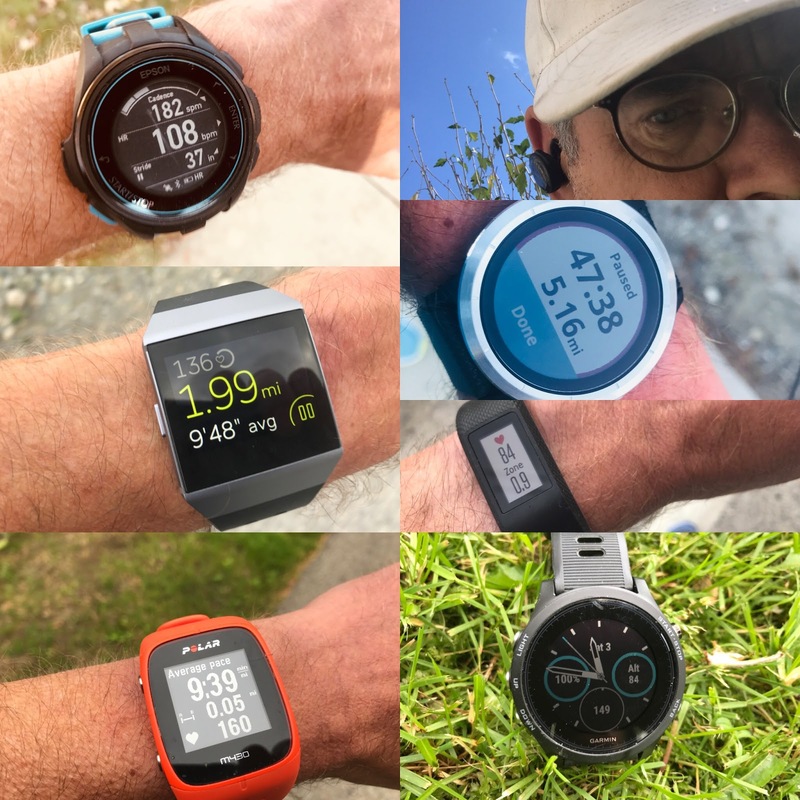 I also have raced many multi-day events (6 and 10 days) the past few years, and aftter days on end of shuffling along at 4MPH and dragging heels, one quickly finds out which shoes have durable soles). After 31 miles of running plus perhaps 10 more of walking, the soles are holding up better for me than do many "heavyweight" training shoes (e.g., I had recent pair of Brooks Adrenalines that started peeling up at the heel after 20 miles total). This is not the first time I have had this issue with the heels on Brooks, and to be fair they have been good about replacing "sub-par" pairs. Sam: Let's not be mistaken. The Sub2 is a full blown racing shoe designed to get "some" elites towards a Sub 2 in as light a shoe as possible. After all, adi cut 2.3 oz /65 g from the weight of their previous flagship racer, and both men's and women's official course world record marathon shoe, the adios Boost. So don't expect the relative heel cush of the adios or the overall cush of the VaporFly which has a whopping 10mm more heel stack and 6mm more forefoot stack but which comes in at approximately 6.8 oz, so 1.2 oz more than the Sub2. What you will get is a snappy, very decently shock free ride in a very, very noticeably light shoe. So noticeably light that my old legs just seem to want to turn more easily in them and I sometimes wonder if I even have anything on my feet and look down to check! I was surprised that even very slow warm up paces were relatively pleasant. As the pace picks up the transitions are smooth and natural maybe to much so for me. The shoe runs controlled and stable throughout the gait cycle but are less explosive and also far less harsh and jarring than shoes with midfoot plates such as the Zoom Streak or GOmeb Speed. My legs have been none the worse for wear after any run in them, surprising given the firmer ride although I was a bit sore at the forward part of the arch area maybe due to to much flexibility there? Is it a ride that would get old me through a 3:30-4:00 marathon? I don't think so, the midsole at heel and mid foot is just to thin for me, particularly the heel stack for this heel striker. It's not quite enough shoe, but if they added a few more millimeters to that magic Boost Light midsole, yes. At 10K for sure it will be my pick over other race flats, and maybe just maybe on a flat course for a half marathon replacing my VaporFly. Peter: Is it possible for a ride to be shock-free and still leave me feeling beat up at the end of a run? I guess so. The Sub-2 is a funny shoe for me in terms of the ride. There’s a narrow range of paces that I can really get into a groove in them (around 7:10-7:15 for me) and when I’m in that range they feel pretty good. I do notice that, due to the firmness, they lend themselves to a slightly quicker feeling foot turnover. Overall I tend to run a little faster in these than I feel like I’m running, but they lack any of the joy or fun factor that I like in a shoe. The midfoot is thin and there’s not a ton of shoe there. They do reward good form, so if you’re a super-efficient runner they may be a good race flat for you. I find them to be less enjoyable at slower speeds. Derek: For a low stack and firm shoe, it actually handles moderate paces fairly well. I think it is a combination of the good vibration dampening and flexibility, which allows the shoe to accommodate a wider range of footstrikes and running styles. With that said, this is clearly a shoe designed for speed. I found the shoe most comfortable with a midfoot striking pattern, and one can really get into a good rhythm at uptempo paces. With a heel or forefoot strike, the lack of stack height really gets noticeable as the miles build up. With a forefoot strike for example, the balls of my feet got sore after about 7 miles. That may well mean that I won’t be using this shoe for races beyond 6 miles, and harks back to my earlier comment about the shoe benefiting from more stack. I think with an extra 4-5mm of stack across the shoe, the shoe could well work for people up to the full marathon. As is, I think it probably works best as a 5k/10k flat and only for pretty efficient runners. It will be interesting to see how the shoe performs on the retail market, and whether Adidas decides to add more stack for version 2. In the "Sub Breaking 2" arms race the contenders have lined up their racers and shoes. The adizero Sub2 takes the conventional race flat to anew level of refinement, comfort, ncredibly light weight and price with state of the art materials and elegant thoughtful design. Those enjoying a firm stable natural low slung ride will dig it. It so far a race flat I actually enjoy to run even daily, which is rarely the case but I would not race it over 10K. For sure it would benefit from a few millimeters of additional Boost Light to broaden its utility and range, for me particularly at the heel while also stiffening the mid foot area somehow to add some pop. The “additional” weight would hardly be noticed. -1.00 for please add some more stack weight isn't everything and a touch more pop at mid foot. While I think the upper is terrific, I’m not a big fan of the ride on the Sub-2. They’re fine--I never feel like I”m fighting against them, but I find the ride to be harsh and I don’t feel like they are particularly inspiring. They do reward good form, so if you’re a super-efficient runner they may be a good race flat for you. Frankly there are other shoes in this category that, for me, blow this shoe out of the water. I’d like some more cushion and a more enjoyable ride from these. Perhaps a slightly wider toe-box too. Great upper, maybe the best no nonsense upper I’ve tried yet. I agree with Peter that this shoe rewards good form. Efficient runners will love this shoe but any break in form and you start to notice just how much ground feel the shoe has. I’m actually planning to use this shoe for an upcoming track race so see how it holds up. 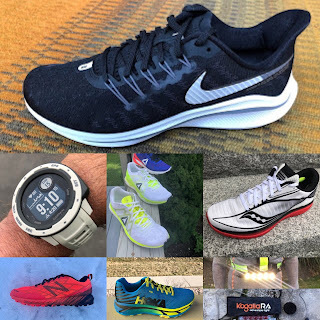 At this weight, I think there are very few contenders out there in terms of vibration dampening, but it is the efficient neutral runner’s market out there right now, with the Altra Vanish-R and Escalante Racer, Saucony Endorphin Racer 2, and Nike Zoom Streak LT4, and all these competitors do not come with a $180 price tag. I think the Sub2 is a great concept shoe, but for mass appeal, Adidas are better off cornering the sub2.5 or sub3 market, and often that means more stack even if it is firm stack. I prefer a little more stack, but beyond that, I think that for all that the shoe has going for it in terms of comfort, vibration dampening and grip, the ride just seems a little vanilla for the title of Sub2. I guess I just expected a more dynamic ride. For me, the Sub2 was fine at slow paces. I could use these in a half-marathon or 25Km race, but think that even with an extra insole they would be too thin for me in a marathon. I did a 14 mile slow run (9:20 miles at 4,200') in them and was o.k., but much more and my feet may well have been hammered. Peter notes he finds the "ride to be harsh" and Sub2's not "particularly inspiring." THAT is what I find in many other racing flats, but NOT the Sub2. Sam: The adios Boost 1 was my goto for many races up to 20 miles. I found its upper superb if snug. The Adios Boost got sloppier in fit and ride and seemingly due to outsole changes thinner feeling in the forefoot. Both were relatively heavy. I would still reach for the Adios for a half but for up to a 10K the Sub2 due to its light weight and firmer more stable yet shock free ride would be my pick. Mark: I lent my pair to two fast high school track runners. They each did each jog a mile and fast 100 meter strides in them. They liked them, said they "felt fast" but that they both still thought they would prefer adios for road races and longer intervals. Peter: No comparison here. The GoMeb is what I wish the Adidas was. It feels a little more forgiving, is basically the same weight and is WAY more fun to run in. I’m not sure I’d take either out for a full marathon, but I’d do shorter races in the GoMeb for sure. Peter: The Floatride is a hair heavier but delivers the bounce and energy return that is lacking in the Sub 2. The Reebok is a really, really fun shoe that blasts through miles with plenty of cushion for it’s svelte frame. A potential marathon shoe for sure. Sam: At only 0.5 oz/14 g more, the Fast has just what the Sub2 needs, 4.5mm more heel stack and 2.5 mm more forefoot. It's similar material PEBA midsole is softer and bouncier and is stabilized with some EVA and a mid foot plate. A far more versatile shoe but not as elegant in its simplicity, design and upper fit but gets the job done at any distance or pace. 4th man, Tyler Pennel and 6th woman, Nicole DiMercurio rocked them at the 2018 Boston Marathon. Derek: I prefer the cushioning of the Fast for sure, though the Sub2 seems to fit me better. Both shoes have superb grip and shoe last a long time. I think for shorter races I’d go with the Sub2, and with the Fast if I had to do a half marathon or a hilly 10k. Mark: Comparing to the NB 1400s, the much higher heel and heel-toe ramp angle is notable. For me the v6 is a bit more streamlined and has more "pop" than many previous 1400 models. I also found the current 1400 narrower and shorter than previous editions as well as the Sub2. (my good friend Jon Olsen did wear a pair of 1400s the whole time in his 11:59:27 then- U.S. record 100 mile-- on a rubberized track). The "crater" in the back end of the sole of the 1400 does attract pebbles, bottle caps, etc..
Mark: Sonic also pretty fits true to size, but a hair longer than Sub2. The Sonic has an even lower 20mm heel and is quite flat in all respects but is more than 2 oz. heavier at 7.7 oz. It is firm, though I do not mind a firm racing flat or lightweight training shoe. I have worn Sonic in marathons and was O.K.although in the past 2 years have fared better in longer races while wearing a lightweight trainer (e.g. Mizuno Shadow in recent 4:23:56 El Paso Marathon-- rolling roads at 4,000'). Peter: Vaporfly all day long! These are so vastly different that it’s almost inconceivable. It’s amazing how different two race flats can be. That said I just had a really comfortable marathon in the Vaporfly and didn’t feel as beat up at the end of it than I did in 8 miles in the Sub 2. Derek: These two shoes are really polar opposites and it’s hard to fathom that they are both targeted at the marathon. I think it goes without question that the Vaporfly is the better marathon shoe, and most people would gladly pay the extra $70, if they could find the Vaporfly in stock! Sam: Totally agree with Peter and Derek. Totally different shoes, approaches and feel. Don't expect the overall cush of the VaporFly which has a whopping 10mm more heel stack and 6mm more forefoot stack, but which comes in at approximately 6.8 oz, so 1.2 oz more than the Sub2. I marathoned most comfortably in the VaporFly to a 14 minute Boston qualifier as well as 8-9 year PB's or close at 5K, 10K, and half in VaporFly so it has range. Sub2 I would not go beyond 10K in. Derek: similar weights and excellent upper and fit from both shoes, but noticeably more cushioning from the Sub-2. This is where I think the Sun-2 shines. The difference in vibration dampening is marked when comparing these two shoes, and while I would limit the LT3 to 5k races, I am comfortable taking the Sub-2 up to a 10k. There is a significant price difference between these two shoes though. SHOP RUNNING WAREHOUSE FOR ADIDAS ADIZERO SUB2!